Last month I decided to try cold brew coffee. I had been thinking about trying cold brew coffee for several months. After my espresso machine was mysteriously broken I decided to make the leap to cold brew. Actually cold brew coffee may be one of the easiest ways to make coffee. It is even easier than one of those fancy single serve machines. The equipment needed for cold brew was a lot cheaper than a new espresso machine. It is the time of year I really prefer cold coffee anyway. What you need: A container to make the coffee, a container for the coffee once it is made and a way to filter the grounds out of the coffee. 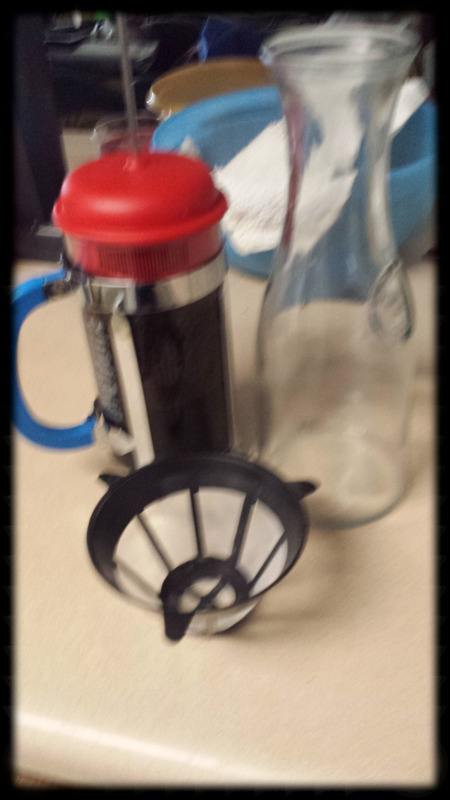 I got a French Press , a Carafe and a reusable coffee filter. Most of the info I found showed using paper filters. I found an inexpensive plastic mesh filter near the paper filters. It seemed to be more stable and I would have to worry about dropping the coffee grinds back in the filtered coffee. The coffee: Some of the sources a I read said that you need a good strong blend, others said it was a good way to get rid of stale coffee. Oh, the coffee needs to be a coarse grind. So far I’ve tried couple of blends from my favorite roasters, Flagship Coffee Roasters. My favorite is The Amelia. Also some sources I’ve read suggest using filtered water. I think it is a little better with filtered water. The ratio of coffee that works best for me 1 part coffee to 2 parts water. 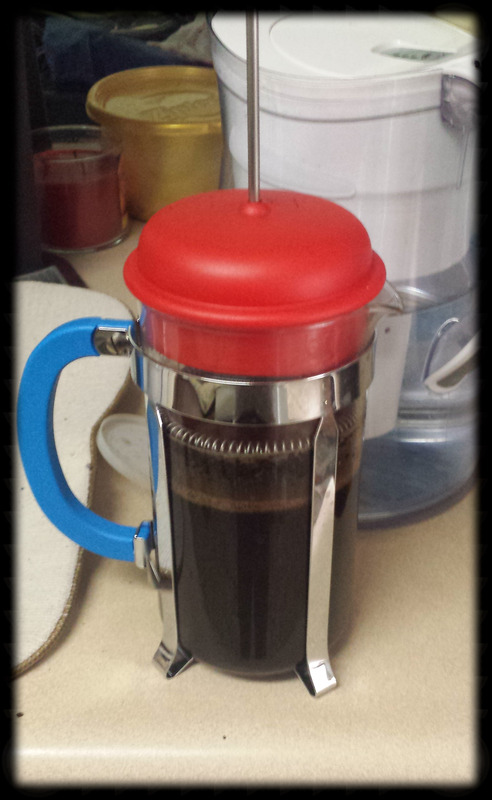 The process: Add the coffee and water to the French press. Stir gently with a wooden spoon to prevent breaking the glass. Carefully insert the top of the press. Push the top in just until it is barely touching the coffee mixture. Allow to sit for 12 hours at room temp or about 20 in the fridge. Next carefully pour the coffee through the filter into the carafe. 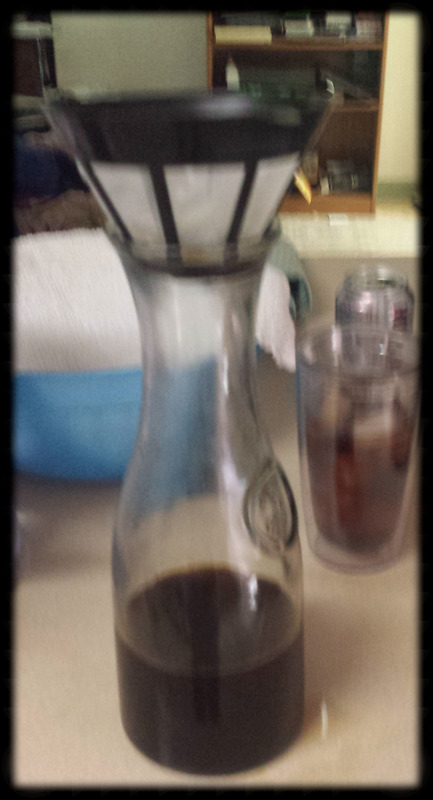 Allow coffee to slowly filter into the carafe. This will make a coffee concentrate that can be stored in the fridge for several days. To drink dilute it with ice, water or creamer to taste. For months I’ve heard Obediah and Nikki from the Riot talk about how cold brew is the best. That is smooth and less bitter than other coffees. I have to say they are correct. It may be my favorite way to drink coffee. I’ve pretty much stopped drinking other types of coffee. Oh, one of the nice things is that my making it in advance I always have coffee available.